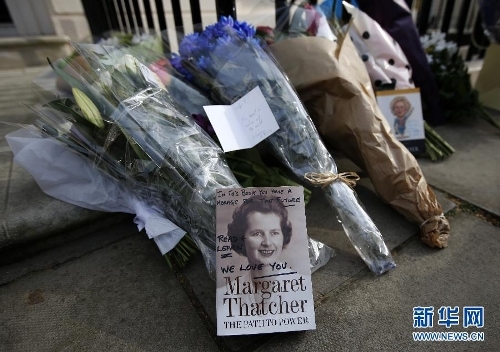 Former British prime minister Margaret Thatcher died on Monday at the age of 87, after suffering a stroke. During her 11 consecutive years as prime minister, Thatcher experienced the climax of the Cold War and the prelude to the collapse of the Soviet Union. She also signed the joint declaration with the Chinese government to hand over Hong Kong and led Britain to victory in the war with Argentina over the Falkland Islands, or Malvinas. She was considered a towering figure and played an important, though limited, role in restoring the British economy. Some have concluded that Thatcher represented the remaining prestige of the British empire and her death marks the end of an era. She was the first female head of state in the West, gaining the nickname the "iron lady." The complicated political environment in which she held her role, a golden era for politicians, made her outstanding. She, among a number of Western and Eastern politicians remembered from that era, is a prominent figure. A political legacy is always hard to define, and the love and hatred still felt toward Thatcher are distinct. Joining hands with former US president Ronald Reagan, she played a crucial role in the collapse of the Soviet Union. During and after the Falklands War she impressed the world with her hard-line stance, which no Western politicians could compete with afterward. Thatcher's first significant encounter with China was Hong Kong's return to the mainland. Before the negotiation between the two parties, many in the UK called for a tough stance toward China. But Thatcher managed to understand that China is not Argentina and Hong Kong is not the Falklands. She signed the joint declaration, which set the foundation for Hong Kong's return. We can say that she made her biggest compromise as prime minister in this issue. It's fair to say this, even though frictions between China and the UK existed until Hong Kong's return in 1997. Her restoration of the British economy represented one of the last glorious achievements of Great Britain, or even Europe. However, her privatization of state-owned industries, tax-cuts to support the powerful and her hard-line stance toward the nation's labor unions, are still ruefully commented on by European scholars. The moment makes the man, or in this case, the woman. After Thatcher left office, there haven't been any "iron men" or "iron ladies," partly because the decline in European power means they cannot uphold an iron stance. The evolution of Western electoral culture makes politicians weak at solving domestic problems. Thatcher could well enter history as a distinctive female politician. Times have changed since the era she experienced. The win-win spirit China brings to international politics is expanding. We have reasons to show respect to this woman that signed the Sino-British Joint Declaration. But at the same time, the world should move on.